Celebrate national holidays with red, white and blue, and make this luscious Easy American Dessert. 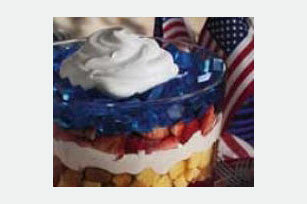 This Easy American Dessert is a flavored gelatin layered dessert that includes whipped topping and fresh fruit. Stir 2 cups of the boiling water into each flavor of dry gelatin in separate bowls at least 2 minutes until completely dissolved. Stir 1 cup cold water into each bowl. Pour gelatins into separate 13x9-inch pans. Refrigerate 3 hours or until firm. Cut gelatin into 1/2-inch cubes. Place red gelatin cubes in 3-1/2-quart serving bowl or trifle bowl. Top with layers of cake cubes, half of the whipped topping and the strawberries. Cover with blue gelatin cubes; top with the remaining whipped topping. Prepare as directed, using 2 pkg. (4-serving size each) of either flavor of JELL-O Gelatin. Prepare as directed, substituting 3 medium bananas, sliced, for the strawberries. Makes 20 servings, about 3/4 cup each.